Preheat oven to 350. Mix the crumbs and the butter until damp. Press firmly into the bottom of 9 inch springform pan. Bake for 10 minutes or until it starts to look dry on the top. Cool. Lightly grease the sides of the pan. Meanwhile, mix together the vanilla, cream cheese and yogurt until well blended. Soften the gelatin in the water in an oven-proof ramekin. Heat about 1/2 inch water in a small skillet. Place the ramekin in the skillet and stir until the gelatin dissolves. While the mixer is running our the gelatin over the cream cheese mixture in a continuous stream and mix until well incorporated. Pour 2/3-3/4 of the batter into the pan. Set aside. Beat the speculoos spread into the remaining batter. Drop spoonfuls of it onto the cheesecake in the pan. Use the tip of a knife to swirl. Cover and refrigerate 6-8 hours prior to serving. *Like this, I found it near regular cream cheese at the supermarket. When we went to Belgium a few years back, one of the many food items we brought back was speculoos spread (speculoospasta). It was made of ground speculoos, the spice cookie that is incredibly popular in Belgium. It seemed so odd and very Belgian we had to try it. I never imagined it would become available here in the US just a few years later. The same brand that made it in Belgium, Lotus, makes it here but under speculoos' American name, Biscoff. Now I can have it whenever I want. I have made my own speculoos, but I saw some imported speculoos cookies a while back (at an after Christmas sale but they had a long expiration date!) and picked them up with the idea I'd make something out of them eventually. 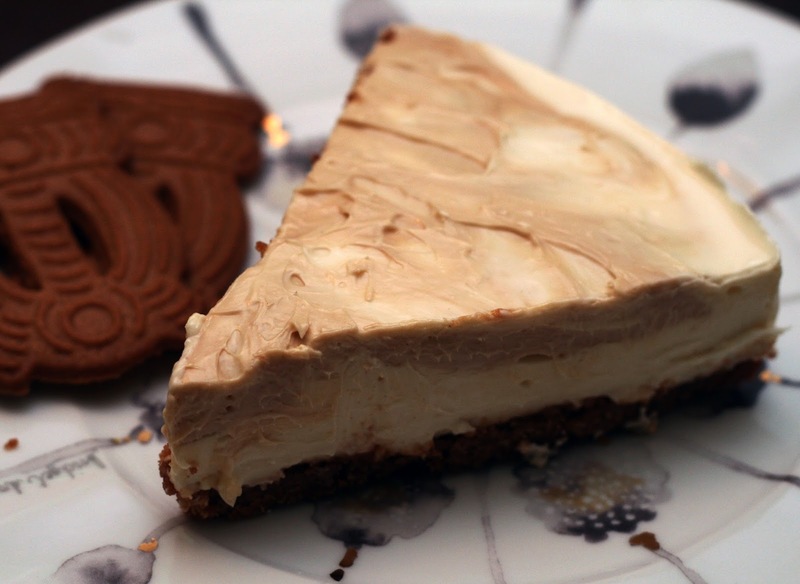 When my husband said he wanted to make me something special for my birthday, I thought it might be fun to make a speculoos cheesecake! Since it was August we went the no-bake route (except for the crust, I guess you could skip the baking step but it is crispier and better tasting baked) and made a light, Greek yogurt-based cheesecake instead of its winter-worth cousin. It was everything I hoped it would be, full of speculoos flavor, creamy and with just a hint of tang from the yogurt. A perfect blend of the American and the Belgian. Bit of trivia: speculoos spread was first invented by contestants on a Belgian television show about inventors, de Bedenkers! They were inspired by a trend of crushing the cookies mixing it with butter and spreading on sandwich bread. They came in third place.